One year and one day from now will be the 50th anniversary of Congolese independence. No one celebrating the birth of the Congo then could have prophecied what a nightmare the first fifty years of independence would be. Tragically, it's not at all clear that the next fifty years will be any better. 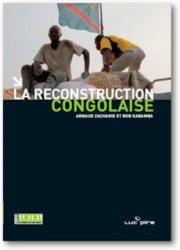 A new book published by the Belgian NGO 11.11.11 paints a bleak picture of current reconstruction efforts in the Congo. The military is incapable of bringing peace to the east, and its joint operations with Monuc have failed to produce results. The economy teeters on the edge of collapse; public finances are routinely mismanaged; the country's foreign reserves have dissipated. The collapse in world commodity prices has had a particularly disastrous impact. Yet the IMF refuses to release the Congo from loan commitments accumulated during the Mobutu years totalling $6.3 billion until it renegotiates key elements of its deal with China. That deal promised $9 billion worth of infrastructure projects in return for access to Congolese minerals. With both the West and China prepared to hunker down in a contest of will, the Congolese are caught in the middle. Vulture funds circle, buying off Congolese debt at discount prices and then suing the government for its return, plus extortionate interest. FG Hemisphere, incorporated in Delaware, recently won a $105 million verdict in a South African court against SNEL, the Congolese electricity company. Meanwhile, three quarters of Congolese people are malnourished and live on less than a dollar a day. Update: It's not clear how to order the book online. It doesn't seem to be available for download or on Amazon.fr.